Summary: The compelling tale of a girl who must save a group of bonobos — and herself — from a violent coup. This might sound strange, but I am fascinated by apes.. all types of apes; and I love books about them. 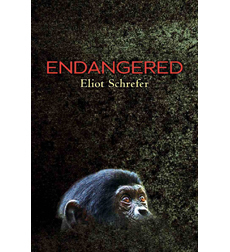 So when I heard that Mr. Schrefer wrote a book for young adults about a young girl who is determined to save herself (and some bonobos) during a coup in the Congo, I knew it was the book for me. And then I heard it was chosen as a 2012 National Book Award Finalist for Young People's Literature, and that pretty much sealed the deal. Not to pat myself on the back or anything, but I was totally right about ENDANGERED. I absolutely, positively adored it! ENDANGERED tells the story of Sophie, a girl who has to visit the Congo to see her mother. She's not exactly excited about spending time at her mother's bonobo sanctuary where her mother puts the apes before Sophie. That is, until she discovers a sickly baby bonobo named Otto; and then Sophie begins to understands how a person can feel so much love for an animal. Sophie's life is then turned upside down in the worst way possible when a violent revolution breaks out in the Congo and the soldiers take over the bonobo sanctuary. To save herself and the bonobos, Sophie decides to flee and ends up taking many of them with her to hide in the jungle. She is forced to grow up entirely too quickly as she learns to fend for herself and fight for survival. ENDANGERED really does have it all -- a great narrator in Sophie, wonderful writing, a suspenseful story, valuable messages, and even a lot of food for thought. It definitely will go down as one of my favorite YA books of the year, and it's worthy of all the critical praise that it's receiving. I could go on and on about so many things, but first of all, I want to focus on the character of Sophie. She is just a wonderful narrator, and I truly think Mr. Schrefer captured the essence of her character perfectly. I loved Sophie, and I even appreciated her "normal" teenage angst about her living situation. However, Sophie really blossomed when she was forced to leave the sanctuary and fend for herself. Sophie showed so much intelligence, strength and resourcefulness; and I think both male and female readers will look up to her and possibly even relate to her. While there were times when I was surprised by just how smart (and lucky) Sophie was, I thought her actions made for a fantastic story! Another thing I really enjoyed about ENDANGERED was that it was a gripping story. Again, I think all types of readers (even reluctant ones) will appreciate the suspense of this novel. I honestly couldn't put it down because I was so vested in Sophie's story. In addition, while the coup in Congo was a fictional part of this novel, it still seemed extremely real to me. I've read enough books about the wars in Africa that I know it's not entirely out of the realm of possibility for something like this to occur; and I think it's important for today's society to be aware of not only the perils of living in parts of Africa, but how fortunate we are not to have to live in fear. And finally, maybe this is the mom in me speaking, but I loved the life-affirming messages in this novel and how much the story made me think. The evolution of Sophie's character really resonated with me, and I would imagine many readers will feel the same way. Although Sophie experienced some pretty amazing things that most teens will never have the opportunity to see, she eventually became a young woman who realized what it means to sacrifice for others. She also learned how important family is and the fragile nature of life. There are many other valuable message woven into this story as well, and I think each reader will walk away with a unique sense of what this story means to him or her. ENDANGERED tackles a lot of very serious issues; and as a result, I know it would make a fantastic discussion book for book clubs or classrooms. Not only does it look at a young girl's attempt to protect and survive, it also delves into some complicated topics about Africa and its political environment. Some additional themes you might want to explore include family dynamics, mother/daughter relationships, sacrifice, war, poverty, safety, and love. Overall, I think ENDANGERED is a wonderful novel for teens and adults, and I highly recommend it. I don't find it strange at all that you are fascinated by apes at all because I am, too! If my health was better I would try to work at the Jane Goodall Institute or at least volunteer in the summer. I love them. I have to add this to my TBR! You will be featured on my Friday list on the blog! I was thrilled when this book was nominated for National Book Award because Eliot was so sweet. I'm glad to see the book is so good! I think most people are at least a little fascinated with monkeys and apes. I love all animals, wild and domestic, so this book will definitely go on my list as of right now! My senior thesis as an undergraduate was on nonhuman primate behavior. I totally understand your fascination. Sounds like an interesting read. I wonder if people are fascinated simply because of Jane Goodall!